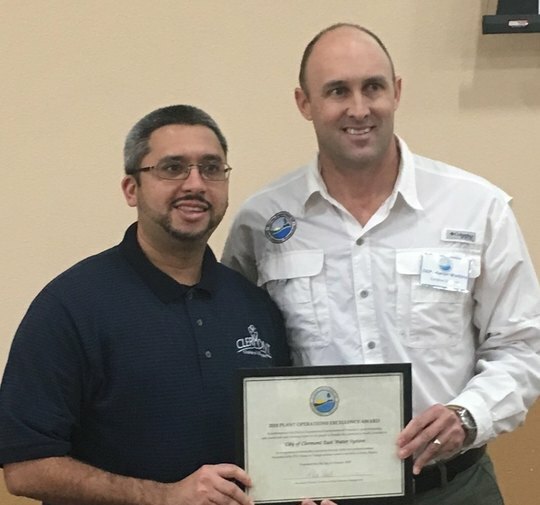 OCALA, Fla. – Today, the Florida Department of Environmental Protection presented a 2018 Plant Operations Excellence Award to the City of Clermont East Water System at the annual Focus on Change Seminar. Clermont East is a repeat winner, having won a Plant Excellence Award seven times. The plant uses advanced metering infrastructure technology to monitor water usage and to target conservation measures where it will pay off most. Each year, DEP presents awards to domestic wastewater and drinking water facilities around the state that demonstrate excellence in operation, maintenance, innovative treatment, waste reduction, pollution prevention, recycling or other achievements. The awards recognize facilities that demonstrate a special commitment to excellence in management through dedicated professionalism and that have an impeccable history of record-keeping compliance. The department is awarding a total of 18 facilities, which includes 10 domestic wastewater facilities and eight drinking water facilities statewide. The awards are being presented at district ceremonies during the Focus on Change Seminars held during the month of February around the state in Haines City, Lake City, Niceville, Ocala, Pompano Beach and Punta Gorda. This is the 29th year that the Florida Rural Water Association has conducted the Focus on Change Seminar in conjunction with DEP. The seminar provides current regulatory information to utilities in order to improve compliance.